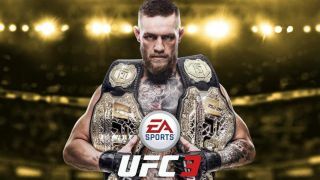 Despite his cross-discipline defeat to Floyd Mayweather Jr, there’s no hotter MMA athlete in the world right now than Irish pugilist Conor McGregor – so it’s little surprise to learn that he’s been chosen as the cover star for EA UFC 3. The revelation of the game’s frontman comes in tandem with its release date, which isn’t far away at all: 2 February 2018. And a select few will get to swing McGregor’s digital fists even sooner, with EA offering a beta across PS4 and Xbox One from 27 November to 1 December. You can register to take part here. For now, most of the features offered in UFC 3 are delivered in marketing speak. Developer EA Canada says every animation has been completely recaptured, with “the most fluid and responsive motion ever in sports gaming”. That’s a bold claim, particularly as no EA game has yet surpassed THQ’s Undisputed 3 in our eyes, but as the saying goes: the proof will be in the punching. That is the saying, right? Also promised are a career mode which EA is labelling ‘G.O.A.T.’, customisable multiplayer modes , and – mercifcully – the option to build a dream stable of real fighters within Ultimate Team for the first time. McGregor will hope his appearance on the cover delivers better fortune than Ronda Rousey’s on UFC 2 did. Her career spiralled following that accolade, beginning with a shock loss to Holly Holm just one day following the cover announcement. EA UFC 3 is released for PS4 and Xbox One on 2 February 2018. No word yet on whether CM Punk will feature - his appearance in UFC 2 was that game's biggest controversy.